Sanjay Ghodawat group is a big name in Pune, Satara, Kolhapur area. One of their earliest and prominent product was Star Gutka. Over time they have expanded to various consumer goods and other businesses- education, consumer goods, real estate and so on. 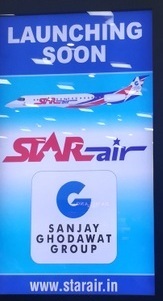 Latest news is that the group is looking to enter aviation sector with a brand name, Star Air. The website is already up but doesn’t have much details. A map on the website shows Pune, Hubli, Tirupati and Hindon (near Delhi) airports, with Hubli as a hub (as per animation) so we can assume they are looking to fly to these airports first, taking advantage of benefits offered under UDAN scheme. Website says airline's corporate office will be in Bengaluru. I saw this ad in Pune airport, which shows a turbo engine jet, which I believe is only representative. It is not clear from when they will commence operation. Launching an airline takes couple of years at the minimum from conceptualization to launch of operations. Assuming Star Air team is halfway through their preparations, may be sometime in early 2019 we should be able to see more details of Star Air’s operations, pricing and launch date information.